The Restoration of an 18th Century Sterling Silver Ladle by Kevin Crane for Crane Jewelers, Ltd.
Punch was extremely popular in England in The 18th century. The word punch comes to us from from Hindi panch (meaning five) and the drink was originally made with five ingredients: alcohol, sugar, lemon, water, and tea or spices.The drink was brought to England from India by sailors and employees of the British East India Company in the early seventeenth century. From there it was introduced into other European countries. Fig l. A group of Gentlemen quietly enjoying the companionship of friends around the “Festive Bowl” of Punch. Punch was in consumed in large quantity from individual cups served communally from a large bowl and dished out with a long handled ladle as seen in the illustration by the English artist Hogarth. The ladels for punch as well as the bowl evolved as the status and importance of punch grew over time. 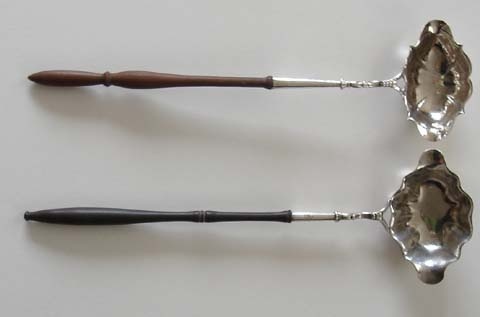 Silver was an important indicator of status and Punch ladles were in a class by themselves. By the The 17th century the punch ladle had become substantial piece of silver, frequently formed from hammered silver coins for the heavy round silver bowls and they featured full silver handles. Due to the scarcity of silver at the beginning of the 18th century new styles had to be developed. The introduction of a non-silver handle and lighter bowls were natural consequences. Handles were made of carved or turned wood, horn, or whalebone making 18th-century punch ladles more fragile than other types of flatware, which makes finding one today in good condition a rare event. Whalebone was heated under pressure with steam until malleable, and then twisted into ornate spirals, which hardened and retained their design after cooling. The double lipped often fluted bowl was introduced around 1740. In our opinion this form is the apogee of a long evolution of design and is the most beautiful and elegant expression of the form. The ladles illustrated in figure 2. Are here Courtesy of the Association Of Small Collectors Of Antique Silver. We restored a lovely George III double lipped, sterling silver punch ladle with a turned rosewood handle. It was of extremely good quality a good gauge and weight with a fluted generous size bowl.It was joined to the handle with a double scroll and was a very fine example made in London by an important maker in the 1780s. This ladle had been in the same family and had been passed down as an heirloom for generations. Unfortunately; it had suffered damage and had been poorly repaired with lead solder. It was in dire condition. The scroll work connection between the Bowl and the ferrel that attaches to the handle was originally sand cast and had been broken in the center, possibly as the result of a faulty casting. The break had been repaired with lead several times . We removed all of the lead from the sterling silver and drilled the core so we could insert a solid sterling silver pin to add support for the weak section. The two parts were then fitted together with a sterling silver pin that had been threaded, tightly fitted and soldered into the holes to add support.. Fig 4.the Punch bowl has been welded with sterling silver to create a stronger joint. The areas around the weld were filed and sanded to blend with the original lines of the scroll work. we were careful to leave as much of the original surface and patina undisturbed. Our goal it to make the repair invisible and undetectable. Fig 5. The piece is in the finishing process. After polishing (by hand) is complete it will be re-attached to the handle with shellac, as it was originally. Fig 6. the finished piece.